The new Valencia Gardens, built in the mid-2000s to replace the barracks-style buildings that were the original housing projects. 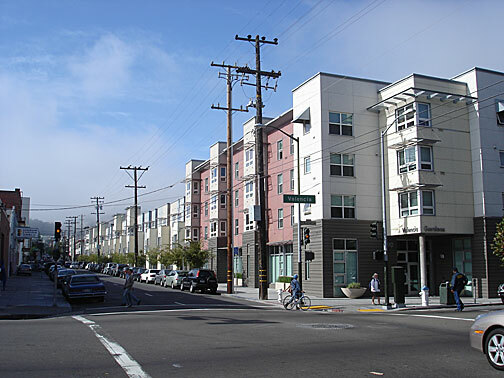 The view up 15th Street from Valencia, 2007. This defines who gets to stay; even if you have a job, you can't afford the housing and you're out of town in Oakland. So a large part of what I do has consciously dealt with "how do you keep people like us in the city?" And not just people like us, people in this room, but people that are economically disadvantaged, ethnically diverse, that cut across all kinds of social agglomerations. Keeping women with children in the city is a big job because they are at the bottom of the economic ladder. How do you maintain housing, how do you construct housing, how do you protect communities from being displaced? Part of that in San Francisco has revolved around really big development issues, and other times you just see this tiny little battle, a little brushfire. What was going on in the '60s, '70s and '80s was a lot of commercial expansion downtown. After the city was way underway in the Western Addition and all of that was going on, Yerba Buena started in the '60s, and it was still going on. Yerba Buena was not only an issue of going in and bombing out that part of South of Market and getting rid of all of the SROs and all the unsavory places they didn't want to fix, but also the city started pushing out from the Financial District core, which was kind of sacrosanct in the city. When I first came to the city, my office was at Broadway and Battery, and it may as well have been in Marin County, because there was nothing. You had to go all the way down to California Street to find anything. There was nothing except the Golden Gateway apartments. There was no commercial activity except a few architects, and a '60s bathhouse. Embarcadero One had just opened up and no one knew where that was. California Street was the boundary for the financial district. It would kind of come up to Sacramento Street, right up Montgomery, and Market Street was the boundary south. You had the PG&E/Pacific Telephone buildings kind of anchoring the far reaches of the southern part of the commercial district, which really ended about halfway between Kearny and Montgomery. It didn't go any further west. But as the pressures started to be, "this is a wonderful place, let us build, build, build, build! ", the Transamerica Pyramid was added in the late '60s, which all of a sudden stretched the parameters of the boundary by going up to Washington Street. Part of the city reaction was "OK, Washington is it, and they zoned the area North of Washington down as an historic district, so the Jackson Square district is on the north side of Washington Street because there was such a battle. Then Bechtel started building south. The Bechtel complex on Beale reinforced what was the PG&E building on the east side of Beale. You started having lots of pressure out into areas that 20 years ago were residential hotels all the way up Market Street. Where the Federal Reserve Bank building is, there were three residential hotels. I know because I focused on office development. I kind of know the bones of what was there, what's in the graves. People didn't go to war to save residential hotels; it was just like "oh good we're getting rid of these scummy little places," except for community people that dealt with housing issues, Chinatown, the Tenderloin and South of Market. 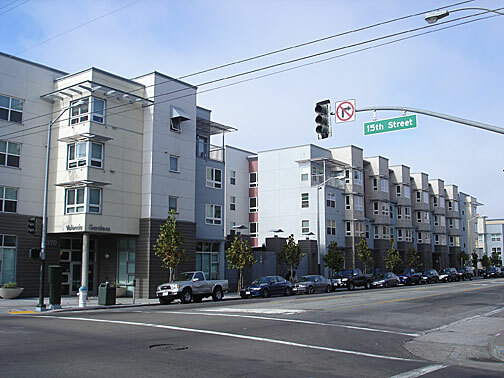 So all of the communities around that poor area started by the end of the '70s, knowing they would foreclose, because projects would come through and all of a sudden what used to be apartments would be a bank building on Sacramento Street. Chinatown had housing all the way down Sacramento Street to Sansome. It was 15 years ago; we're not talking really ancient history. There had been the highrise battles in 1971 and '72 and they had been strictly highrise. Moscone was elected and he said, "No highrises are going to be built during my administration." That was part of his official candidacy for mayor; running against highrises, he really made those statements, kinda backslid a little, but for a period of three years after he was first elected, there weren't any approved. The Planning Commission was dealing with other issues, not rubber stamping office buildings. The first office building they approved under the Moscone administration was Levi Plaza which wasn't really an old-fashioned office building, but rather an interesting agglomeration of office, housing and park, a low-rise office building on the waterfront. That wasn't really that controversial. --Sue Hestor is one of San Francisco's most tenacious fighters against corporate urban planning. This speech was made at New College, autumn 1994.